Belgian-style strong golden. This Belgian inspired ale is pure evil! The result of an easy drinkability despite being nearly 8% in alcohol. Gargamel, cast a spell of delicious deception. 31 IBU. My friend Brad from the Richmond VA area was up this way for some training and brought up some regional beers. A few of these were Belgian Pale/Blond in style and I really do not want them to age any more than I have already. So it looks like a Belgian Pale night with three beers of a similar Belgian Pale style. The first up of these three beers was Soul Shine from Starr Hill Brewery, then we had Hardywood Singel and finishing the evening with Devils Backbone Azrael. So let’s see what Azrael has to offer. Before you take me as a lush tonight’s reviews are over a 4 hours in time. The beer pours a clear golden color with a fairly light bright white head. There is not much on the nose just some light pale malt aromas with maybe a touch of a citrus note. Not a bad first sip but I must say I’m a little disappointed after just reviewing Hardywood Singel. The taste starts out with pale malt sweetness up front followed by very little of a mouthfeel as the ale moves over the tongue in the middle of the sip. There is just a slight hesitation at the top of the swallow. The finish is actually pretty nice with richer pale malt flavors followed by a nice alcohol sweetness followed by a touch of yeast and citrus. There is not much of an aftertaste just a touch of malt sweetness. This is a very easy drinking beer, especially since it’s close to 8% ABV. This is such an easy drinking beer I have to let it sit for a while to open up. I’m not doing much righting but sure am drinking this down. The malt flavors are more pronounced and sweeter as the beer warms and opens up. Still missing are any real noticeable Belgian yeasty flavors. B- | A rating of a C really doesn’t seem fair but I was not overly impressed with Devils Backbone Azrael. It’s a very good beer just not a very good Belgian Strong Pale. 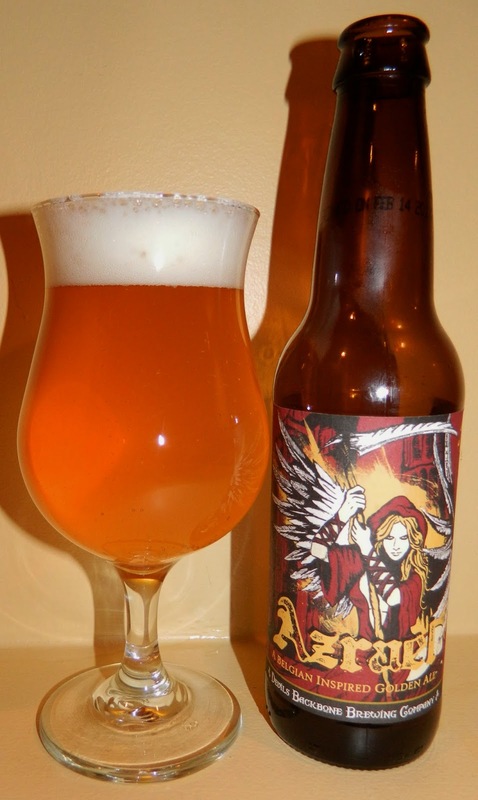 Azrael is a very easy drinking ale with nice pale malt flavors finishing with some citrus notes.